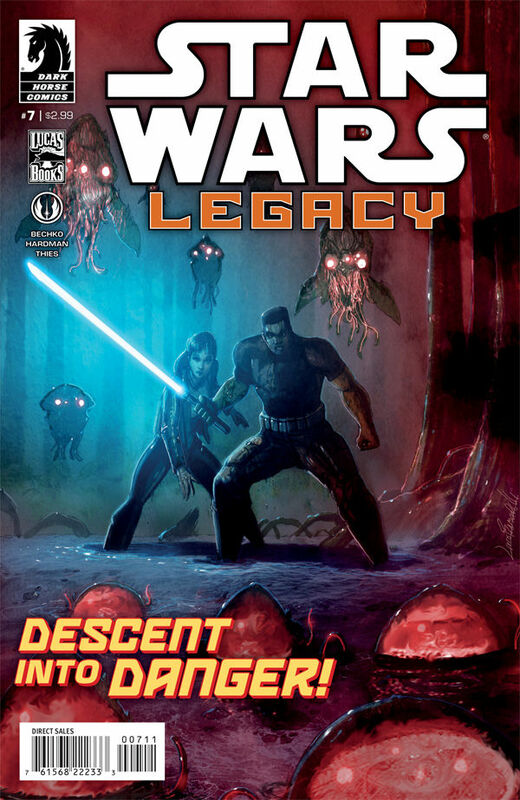 Star Wars: Legacy #7 takes place 138 years after the events in Star Wars: Episode IV – A New Hope and features a descendant of Han Solo – Ania Solo – and a jedi named Jao on their quest to save the galaxy. Yup, the main characters of this expanded universe Star Wars series are a black man and a female Han Solo. Everything I ever wanted in a comic. The plot is fast-paced and interesting, with plenty of mysteries, but never so many as to leave the reader frustrated. Ania is a straight-talking, “shoot first” kind of girl with plenty of room for her character to grow. I also love the art and all the fantastic creatures in the series. The colors and design is dark and lovely, and really fits the Star Wars universe. After a terrible vision of Empress Fel being struck down by a Sith, Ania Solo and Imperial Knight Jao ignore direct orders and set out in search of the murdering Sith. It’s the right thing to do…but it’s also scratching their itch for adventure!